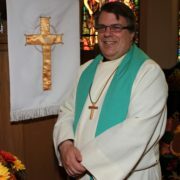 Warner joined the congregation of Grace United Church in September of 2016, moving, along with his partner Ellie, from Northwestern Ontario, where he served St. Andrew’s United Church in Sioux Lookout. Ordained in 2012, he is a graduate of St. Andrew’s College in Saskatoon, Saskatchewan. Ellie and Warner are both voracious readers who also love live theatre. They have two daughters; Abigail, a student at Brock University and Elizabeth who attends McMaster University. Warner has BAs in History and Dramatic Arts from McMaster and worked for his hometown newspaper for two decades before following his call to ministry. For Warner faith is best expressed in and through community. Gathering together to worship and learn with those who will support you, challenge you and encourage you so that we all may realize the great potential God sees for all of creation. Nancy has been a member of the United Church of Canada since baptism. She joined Grace United Dunnville in 2011. 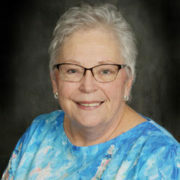 She has been active in the UCW and sits on several committees. Nancy is retired and keeps active with her grandchildren, pets and travelling. Mary Burden is Dunnville Grace United’s secretary. If you have a question and aren’t sure who to ask, Mary can help! 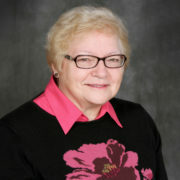 Her office hours are Tuesday through Friday, 9:00 a.m. to 12:00 p.m. You can reach her by email or by phone: 905-774-4504. 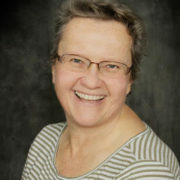 Marnie Green is a lifetime member of the United Church of Canada, and has been a member of Grace United since the early 1980s. Both a parent and a grandparent, Marnie is also a retired nurse. If you have a pastoral-care need, please contact Marnie at 905-774-3093 or by email.